Gooooood morning, readers! 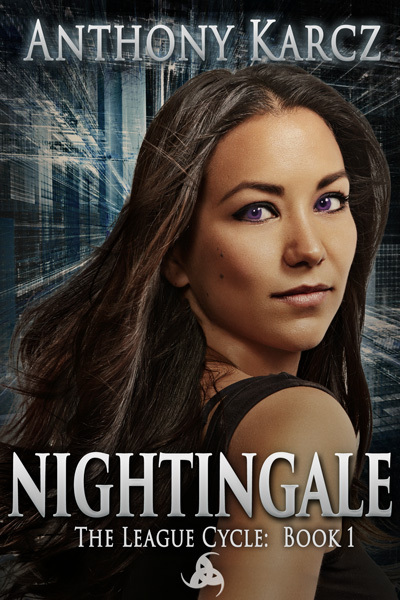 There’s just one day left until ‘Nightingale’ hits the shelves! Well, the virtual shelves at any rate – real shelves will come once you lovely people start leaving reviews. I’ve got one more excerpt to whet your appetite. You can read more about Magnificent and her crew tomorrow! Magnificent’s stomach groaned with the sound of a trapped, angry cat. She sat on the patio facing the League kitchen. After they carved out the office park, they built a veritable Garden of Eden around it to discourage the curious. This was where Magnificent went when she needed to be alone, or meditate, or simply remind herself that the world wasn’t completely comprised of asphalt, gravel, and people trying to kill her. Almost an hour ago, as she sat down with her no-sugar, no-milk steel cut oats, she watched Jersey Devil, who was not actually from New Jersey, nor a demon, and unable to use his superhero name in public due to a variety of lawsuits, spend the better part of thirty minutes lining baking sheets, laying out what had to be two pounds of thick-cut bacon, and piling it all into the oven in The League kitchen. He strolled in later, whistling softly to himself and opened the oven door to turn the pans. The odor that emanated from the kitchen was nothing short of orgasmic. Not only did it make her crave the salty, fatty, ultimately death-bringing strips of pork, it made her deeply resent the gruel that she was forcing herself to eat in order to “stay healthy” and “avoid excess calories.” Things that Warden said she had to be mindful of now that her metabolism was out of whack. She pushed the bowl of oatmeal, maybe a touch to hard, and winced as it bounced off the bench on the opposite side of the table on its way to the ground. The clatter made JD look up from his bacon-tending. He met Magnificent’s scowl with his biggest grin, turned and whistled his way back out of the kitchen. Maybe he had some demon in him after all.